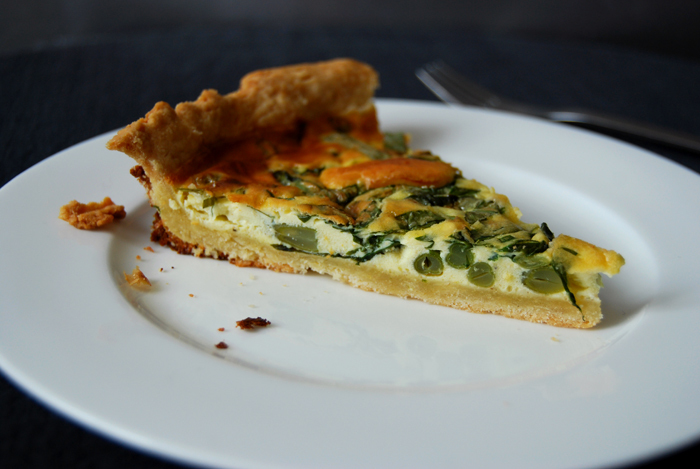 Quiche is one of those dishes which makes me feel good, always, no matter what my day has been like. As soon as I see a quiche in my oven and smell its buttery aroma spread through the kitchen I have to smile. Maybe it’s the butter, or the eggs or the fact that I can look forward to another tart on my plate! That’s why I’ve already written about a couple of my quiche recipes, my classic with leek, tomatoes and thyme, the Italian one with fennel and parmesan and here is another one, packed with greens. 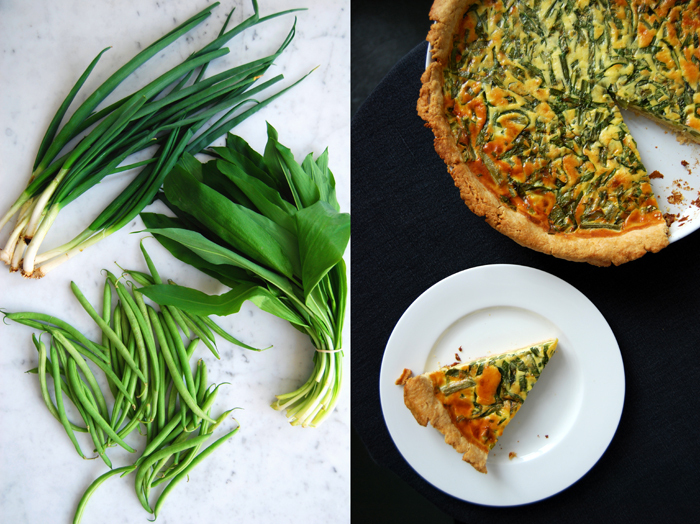 I fill this savory tart with beans, ramp (wild garlic) and spring onions and it has a deliciously light spring feeling! I’ve praised its short crust at length which is so crisp and buttery, to me it’s just perfect. My quiches always have a thin layer of an eggy and creamy mixture to keep it light and to leave space for the vegetable filling. Some recipes focus on the creamy filling which can make a quiche too rich and heavy, at least for my taste. 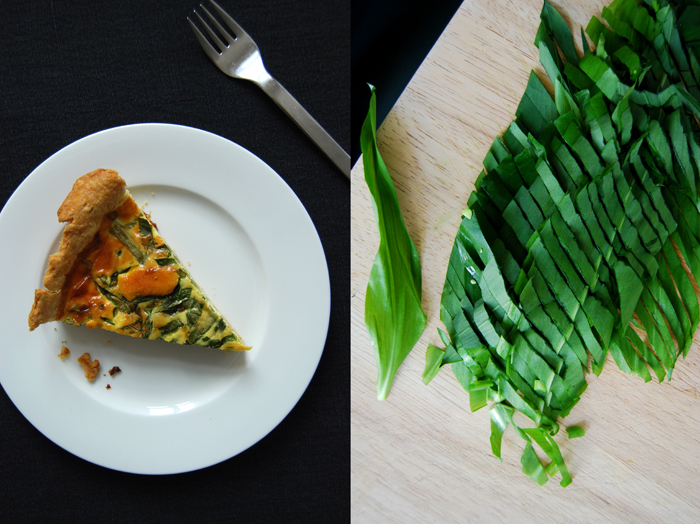 I want to be able to eat a piece of quiche with my fingers, a tart for a picnic! 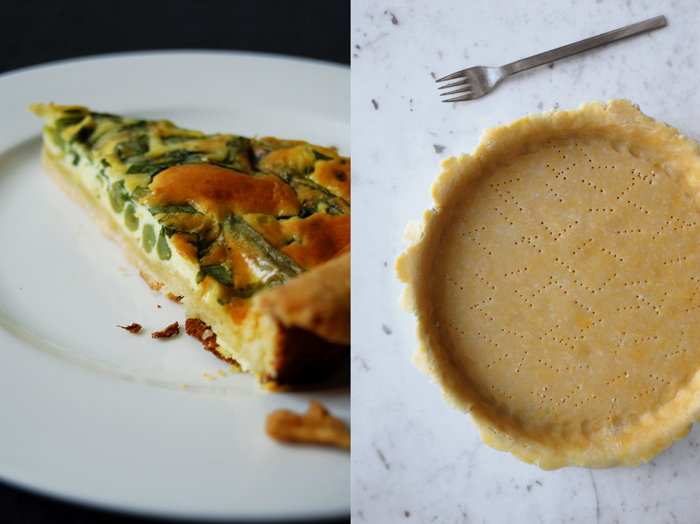 For one quiche you need a round (27cm / 10.5″) or oval baking dish or tart pan. Set the oven to 210°C / 410°F top/ bottom heat. Blanche the beans in plenty of salted water for a couple minutes until al dente. Mix the eggs with the heavy cream, crème fraiche, salt, pepper and nutmeg. Roll out the dough between cling film and line your baking dish with the flat pastry. Prick it with a fork and blind-bake in the hot oven for 10 minutes. Take your baking dish out of the oven and set the temperature down to 180°C / 355°F. 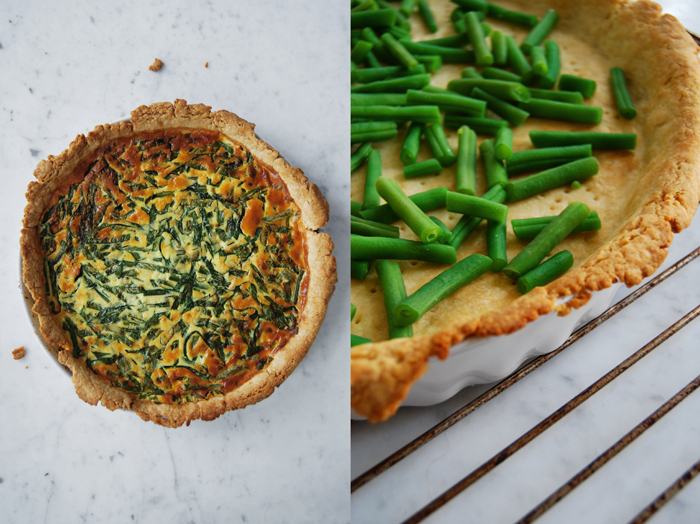 Spread the beans, ramp and spring onions on top of the pre-baked pastry base and pour the liquid mixture over it. Put the quiche on a baking sheet in the oven and bake for about 45 minutes or until golden, the top should be firm. Let it cool for 10 minutes. What a beautiful quiche, your crust looks amazing! Meike, this quiche looks fantastic! It is not common to use sour cream in quiche here, but I would love to try it. I know I won’t be able to find ramp, do you think baby kale could be used instead? I recently made a crustless quiche (frittata?) using baby kale, and liked how it came out (the recipe is one my blog if you wanted to have a look). Thank you Mila, I will take a look at your frittata! I’ve never tried it with kale but I’m sure you could use it, especially if it worked well with your quiche. Ramp adds a garlicky spiciness to it, but you could also use leek, or garlic roasted in its skin and mixed into the egg mixture. I use either crème fraiche or sour cream for the mixture, both work but the crème fraiche is a bit richer.